Welcome to the Pinholics Anonymous® monthly newsletter, serving the Washington, D.C. greater metropolitan region for pinball enthusiasts. This newsletter provides a list of upcoming pinball events, including leagues, tournaments, and shows. Check out the Pinholics Anonymous Regional Calendar that provides a list of all events in the region as well as important national events and shows. You can even filter on type of event, organizer, league and more. Now you can export the iCal feed from the Regional Calendar directly into your Google calendar or other calendars supporting iCal. Google and other services update once every 24 hours. You can even export multiple custom filtered calendars to see only the event types such as a specific league or local events on your personal calendar. Give it a try. 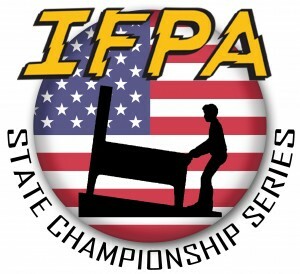 The IFPA State Championships will occur on January 20th throughout the United States and Canada. These championships feature the top 16 players in each state or province based on total WPPRs received in each. Players may only play in one state or province's championship. Final standings will be official on January 4th and acceptance of invites is due by January 7th at 9pm ET. Your IFPA rep will send out invites, and in many cases they have already sent out initial invites based on standings that are not expected to change on the 4th. Washington, D.C. is also included and will play at Lyman's Tavern. Virginia will play at the Richmond Pinball Collective in Richmond, Virginia. Maryland will play at Crabtowne in Glen Burnie, Maryland. Good luck to all players vying for their spot in the North American Championship on March 1st in Las Vegas, Nevada. 1/20 IFPA State Championships $20-30 Across the U.S. Starting in 2018, all IFPA sanctioned open (non-restricted) tournaments in the United States and Canada will require a $1 fee / player. These fees go towards the IFPA State and North American Championship prize pools. (75% to respective state/20% to North American Championship/5% to cover processing fees). Tournament directors will be responsible for collecting these fees and remitting payment to IFPA using the new IFPA Tournament Management tool. See the IFPA website here for more information on the manager. Tournament directors have the discretion to simply take the dues out of the overall prize pool, charge a separate $1 / player fee, or other method such as getting the venue to agree to paying the fee. Played at Lyman's Tavern on Thursday at 8:30pm, Monday at 2:00pm, and Black Cat on Sunday at 7:30pm. Players can play either of those three times each week. Dues are $20 for the 8 week season. Four FSPA leagues are held in four locations. A new team league at Holy Frijoles in Baltimore, Maryland will start on Thursday, January 11th. Team up with your friends or arrive solo and be paired up on a team. Website with details here (closed Facebook group but you can join to get more info). Did you know there are now THREE pinball circuits/series/championships in the Washington, D.C./Baltimore, Maryland metro area? The original Pinholics Anonymous Pintervention Circuit Championship begins its third year with the first event of the 2018 season at MAGfest this week at the National Harbor in Maryland. More info on events for this year can be found here, along with changes to the format that will be finalized mid-January. The VÜK Veekly Series is returning to VÜK in Bethesda, Maryland. This comprises a weekly two strike tournament following the FSPA league on Sundays. The top 24 players in WPPRs earned during those tournaments qualify for the championship to be held the Sunday after the series concludes. More info can be found here. The new Cathode Ray's Open Series comprises four opens (one for each season) that then culminates in a finals in December. The top 16 players in WPPRs from the four opens are eligible to play in the finals. More info can be found here on the series, finals and their upcoming Pinball Olympics scheduled for May 26th. Introducing a new section to the newsletter that lists local machines for sale to help connect locals looking for their first (or tenth : ) pinball machine. Email us to get added to this list each month. We'll keep it concise with contact information to help you find out more from the seller. Spider-man Black, owner Skip Vachon. Email Kevin Stone for info. Batman 66 Premium. Email Cristin Gasson for info. The Pinabler Tour is in its last month of this tour. Players have until January 31st to submit scores. Players should submit scores within 1-2 weeks of playing in order to keep standings current. Finals will be held at the new location, Holy Frijoles in Baltimore, Md on February 10th. Entry fee will increase from $20 to $25. The Pintervention Circuit prize pool fee will be eliminated (formerly $60). The new IFPA fees of $1 / player will be paid for all participating players from the entry fees. The $5 increase and Pintervention fee removal will help offset these IFPA fees and increase the prize pool payouts for the top 4 finalists. For more details on the Pinabler Tour and how it works, see the website. If you have any questions about how it works, you can always email us through the Pinholics Anonymous contact from on the web-site. The 2017 season has concluded with an exciting finish where Dave Hubbard and Justin Bath fought it out until the last game of the Pinholics Anonymous tournament to capture the top seed. Finals will be held on January 27th in McLean, Virginia. Official invites will go out to players on January 8th. 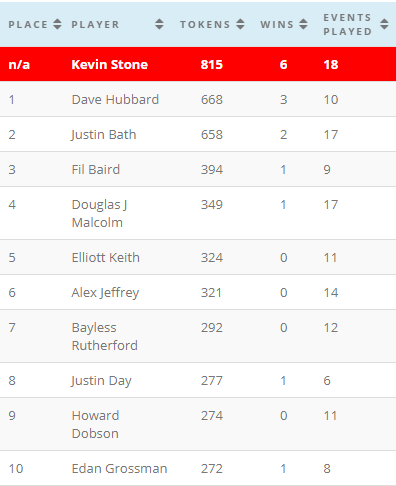 The Top 10 players in standings as of December 31st are below. See the website for final standings. Best 10 events count towards standings. Kevin Stone as organizer is not eligible to participate in finals. Copyright © 2018 Pinholics Anonymous ®, All rights reserved.